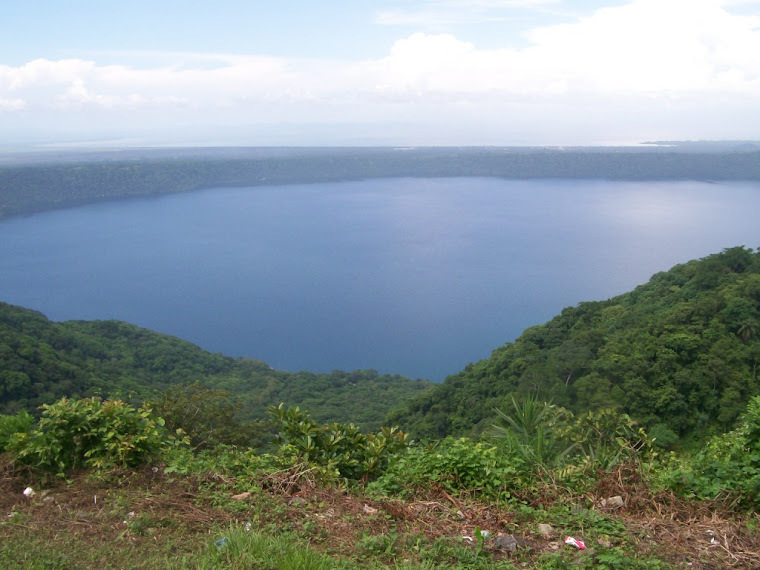 People are always asking what is to see in Laguna de Apoyo during a SCUBA dive. Lots of folks have Open Water certifications these days, but most of them have only dived in tropical oceans, over coral reefs where brightly colored fish dazzle. Tropical coral reefs are indeed among the best eye candy on the planet. But people are intrigued when they learn that we SCUBA dive in tropical lakes when the ocean is so close. It's obvious to them that something very attractive must be going on down there to keep our attention, with coral reefs just a couple of hours away. We at FUNDECI/GAIA study the fish in this lake and in other freshwater locations in Nicaragua. Lake Apoyo has clear, warm water (28 degrees C) which makes it easy to view the fish underwater. Our divers have been collecting data on the fishes of Lake Apoyo for years, learning about the differences between very recently evolved species and even documenting the species themselves. 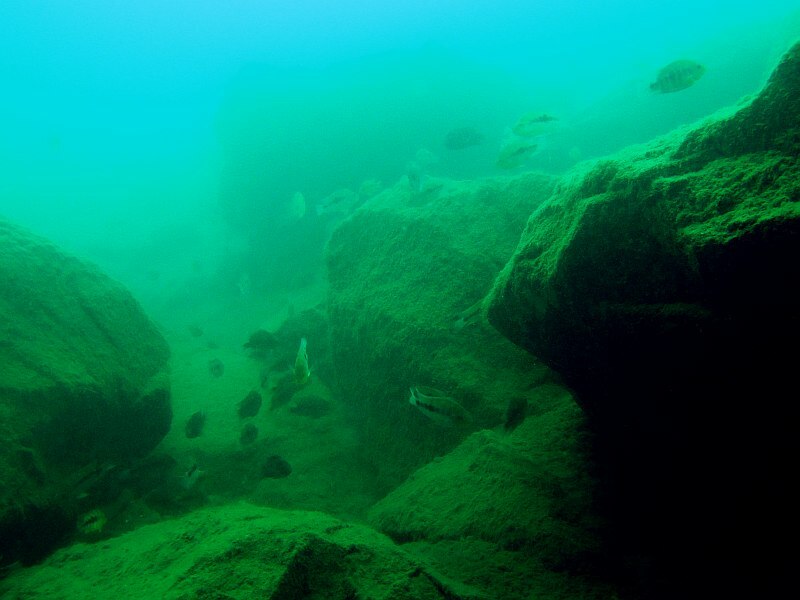 Over the years, other research groups have also become interested in the cichlid fishes of Lake Apoyo and neighboring lakes, especially the group headed by Axel Meyer of the University of Konstanz. The fish of the Midas cichlid group are definitely the main attraction in Laguna de Apoyo. Since the lake was formed some 23,000 years ago, the lake has been colonized by a few species of fish, but the dearth of species in the lake has left numerous, broad niches available for specialization in feeding, refuge behavior, and nesting activity. The Midas cichlids in the lake have undergone a remarkable evolution, dividing into numerous species. Six species from this group which are only found in Laguna de Apoyo are now accepted in the scientific community. Publications which present these six species can be found here, here, and here. These cichlids are terribly similar, but they do not interbreed, and they even use different timing and locations for nesting in the lake. The video presented above, produced by Willem Heijns, is among the best quality of videos showing some of these species in their natural habitat. We hope you enjoy seeing this video. Thank you, Willem! It is no surprise to anyone that plenty of people live in poverty in Nicaragua. Many people in northern Nicaragua, in particular, live in immense poverty, where they are dependent upon the coffee harvest to survive. But not all is negative in the countryside here. At The Mountain School, we work with rural people to improve their living and working conditions. 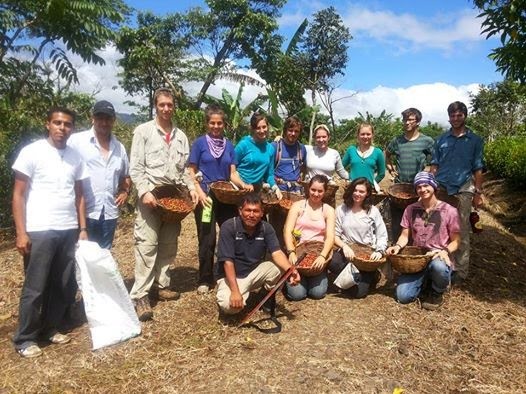 We recently hosted students from the Leapnow program at The Mountain School, in La Dalia, Nicaragua. The students in this program alternated Spanish classes with activities with local children, an introduction to coffee production, the natural environment of the area, and other aspects of Nicaragua. 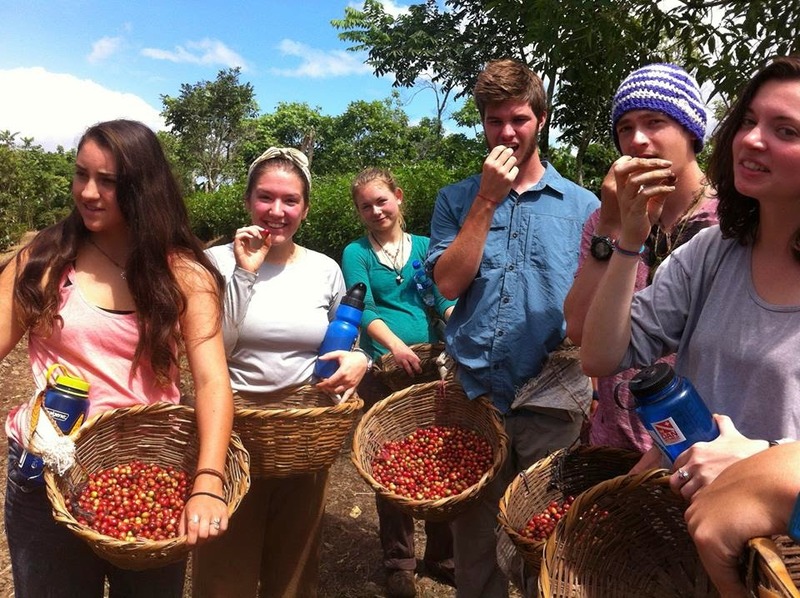 These students are learning what it means to make a cup of great, Nicaraguan coffee. Photo Gigi Austin. Lots of people visit Nicaragua from far-away places like the United States these days. In fact, Nicaragua has been gaining in popularity among travelers like never before. But more is interesting about Nicaragua than just a lazy sunset on a sandy beach. The government and the civil society of Nicaragua are facing the challenges of poverty, of inequitable distribution and power, in fascinating, creative ways. Many Nicaraguans are involved in working with poor and marginalized people in Nicaragua. We at FUNDECI work at The Mountain School together with the Santa Emilia Estates and rural communities in La Dalia, in Matagalpa Department, Nicaragua, to promote better lives for the rural poor. Most poor people in the region of La Dalia pick coffee during the peak of the season, from October through March, each year. Unlike the poor of so many other countries, the majority of Nicaraguan rural people are small-scale landholders, which means they can alternate paid activities on the farms of other people with activities on their own land. They can farm basic staples such as corn and beans so they don't have to pay cash for them, saving the small amount of money they earn from other activities to cover the few necesities they just can't get except in the cash economy. Many of these farms are now enjoying extra income, thanks to organic certification and fair trade marketing. Eating raw coffee beans in the hull is not recommended! Photo Gigi Austin. 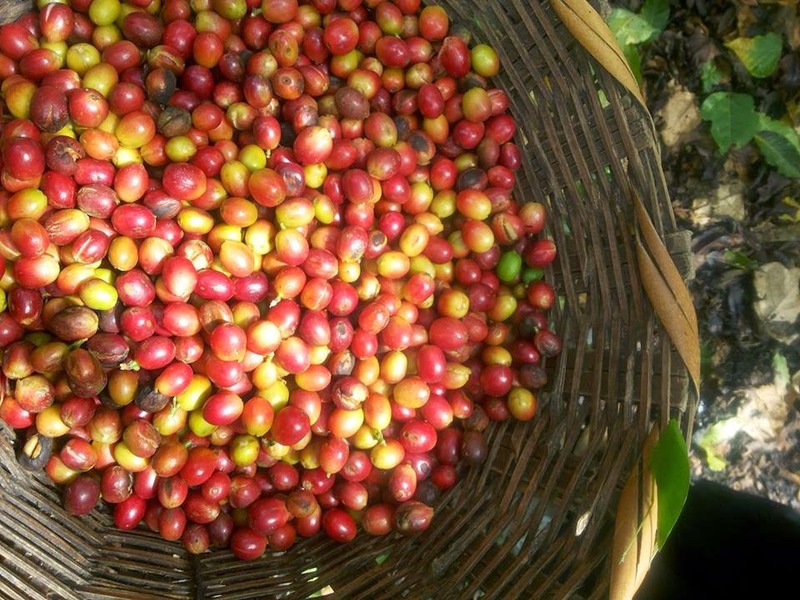 As the Leapnow students learned, coffee picking is hard work. They jokingly asked how much money they would be making from their harvest, but they knew that their earnings would not be much. Experienced coffee pickers move fast and they still earn very little. Life for the rural poor is very humble, because there just isn't any way they can become wealthy, one coffee bean at a time. This year's coffee harvest promises many jobs for Nicaraguan poor people, and profits for small-scale farmers. Photo Gigi Austin. Picking coffee and learning about how coffee goes from the bush to the coffee cup is just one aspect of Spanish study at The Mountain School. The Leapnow students also dedicated several mornings to help the staff at the "ludo-biblioteca". This invented word means something like "fun library". This space is dedicated to the students of the nearby schools, to promote reading and creativity. These children come from homes where the parents can read little or none, and no books are ever seen in the home. 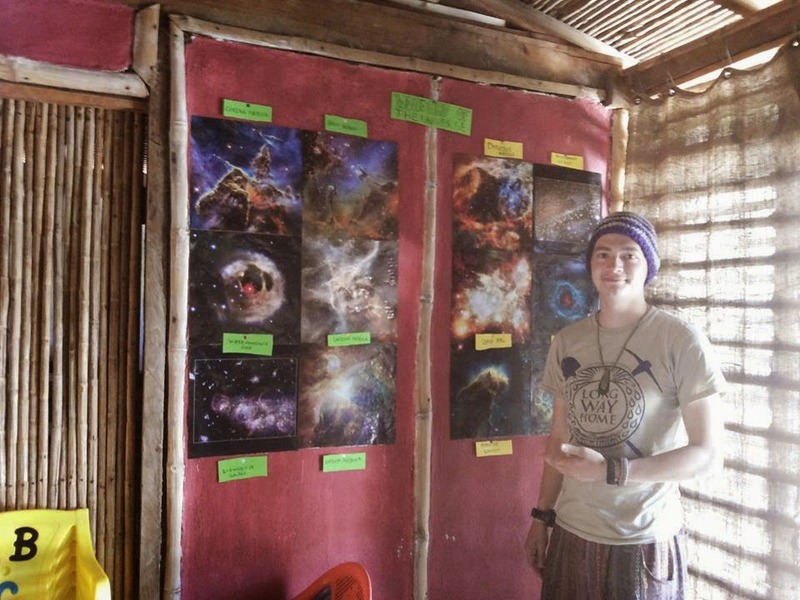 Leapnow students designed an astronomy exhibit for the local children in the after-school library project. Photo Gigi Austin. Opening the world of imagination and information to poor, rural children ranks among the most noble of causes. The Spanish students from Leapnow gave of their time and abundant energy to decorate spaces, including a small exhibition of the wonders of astronomy. The skies are often clear in La Dalia, allowing ample views of starry nights. Hopefully, these children will see the same patterns that someone once named Orion, the Southern Cross, and Gemini. Or what if they even make their own designs among the arrays of lights? 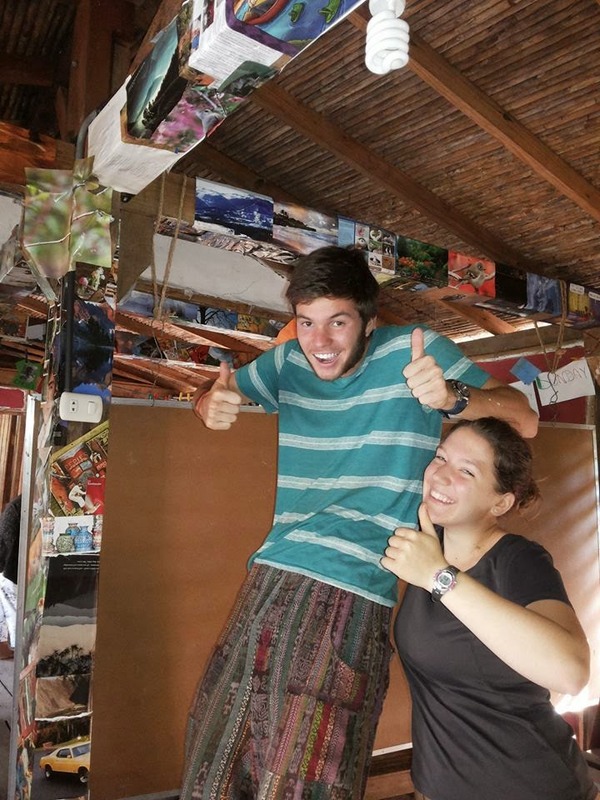 The Leapnow students helped decorate the after-school library at The Mountain School. Photo Gigi Austin. Water will surely be the binding topic of the twenty-first century, worldwide. So many people will be without, others will be pressured to share. Floods and rising oceans will harm the lives of millions. In La Dalia, water abounds, year round. Streams teaming with clear, cool water flow faster than sound, tumbling over rocks and crashing in cascades. 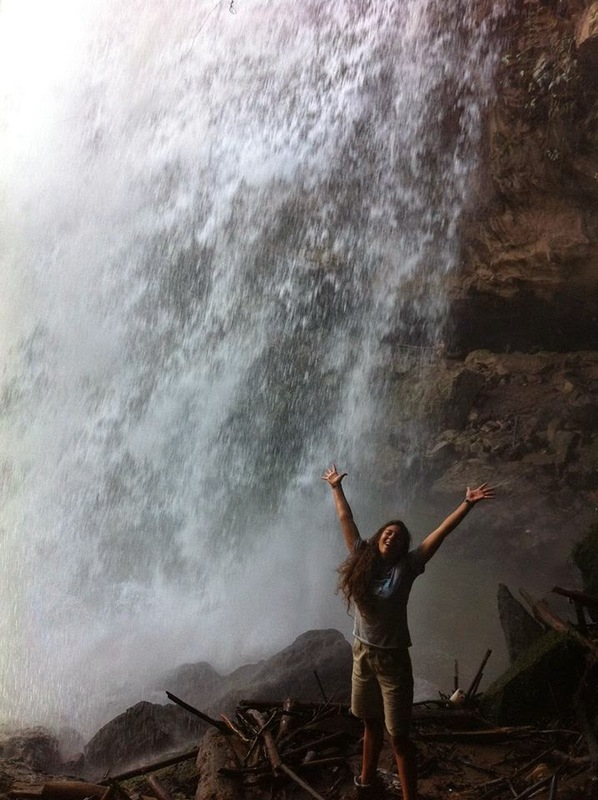 Water abounds in the mountains of northern Nicaragua. Photo Gigi Austin. The Leapnow students took a cool swim in a nearby stream. Meditation in the mist of a cascade brings one ever closer to our origin. There is so much on this earth to enjoy just as it is, natural and simple. There is something of renewal about swimming; water brings us rebirth. 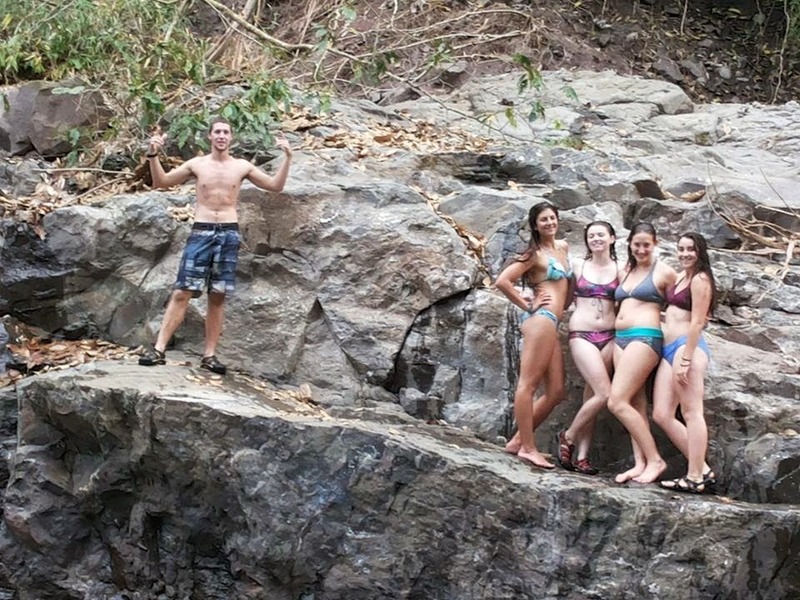 Spanish students enjoy an afternoon swim near The Mountain School. Photo Gigi Austin. The Leapnow students moved on and we are now preparing for the coming week, but we are grateful for Gigi, Skyler and all the students for sharing with us these two weeks. As camera technologies advance, photography continues to become a more interesting option for birdwatching activities. Today, one does not have to be a professional or invest thousands into a hobby to take good pictures of birds. Many of our visitors at Estacion Biologica Laguna de Apoyo come especially for the birds, and some of them even take great photographs. Here, we present the second blog entry highlighting the photography of birdwatchers Jesse Bickley and Anna James. Great Kiskadee (Pitangus sulfuratus) is very common in the Laguna de Apoyo Nature Reserve and throughout wooded areas in the Pacific region of Nicaragua. Photo Jesse Bickley and Anna James. The Keel-billed Toucan (Ramphastos sulfuratus) are always pleasant discoveries here, where they are easier heard than seen. Great photo shots of this species may be difficult, because they prefer forest canopy. Photo Jesse Bickley and Anna James. Long-tailed Manakins (Chiroxiphia linearis) males dance and sing to attract a mate. The senior male dances in tandem with a junior male who requires up to four years to reach sexual maturity. Photo Jesse Bickley and Anna James. The male Elegant Trogon (Trogon elegans) makes an unattractive growl but is quite a beauty to see. Photo Jesse Bickley and Anna James. The Black-headed Trogon (Trogon melanocephalus) is quite common on the north side of Lake Apoyo, where Estacion Biologica is located. Photo Jesse Bickley and Anna James. Our national bird is the Turquoise-browed Motmot (Eumomota superciliosa). 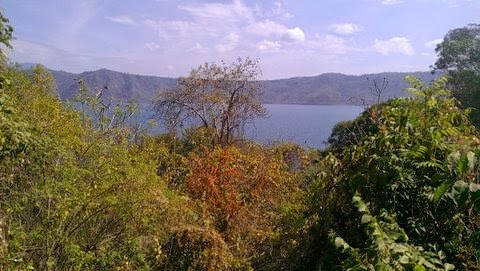 The abundance of steep banks with loose, volcanic soils make Laguna de Apoyo Nature Reserve ideal habitat for this bird. Photo Jesse Bickley and Anna James. The pendulum-like swing of the tail of the Turquoise-browed Motmot (Eumomota superciliosa) is thought to discourage predators. Photo Jesse Bickley and Anna James. The Clay-colored Thrush (Turdus grayi) acts and even sounds similarly to the American Robin of North America. Photo Jesse Bickley and Anna James. Male Summer Tanager (Piranga rubra) make fill our forest with bright color about seven months per year. It accompanies hundreds of other birds in yearly migration, reproducing in North America. Photo Jesse Bickley and Anna James. The red bill and rusty tail distinguish this bird as the Rufous-tailed Hummingbird (Amazilia tzacatl), much more common in Eastern Nicaragua than in the forests of Laguna de Apoyo Nature Reserve. Photo Jesse Bickley and Anna James. The Great Kiskadee is very common in forest edge throughout the Pacific region of Nicaragua. Photo Jesse Bickley and Anna James. The Chestnut-capped Warbler (Basileuterus delattrii) is the only year-round resident warbler of the reserve. Photo Jesse Bickley and Anna James. Cuckoos such as the Groove-billed Ani (Crotophaga sulcirostris) have a distinctive smell which may serve to protect them from predation. Photo Jesse Bickley and Anna James. The Montezuma Oropendola (Psarocolius montezuma) nest communally. Males and females divide the work around the nesting site. Photo Jesse Bickley and Anna James. No photo essay on birds in Nicaragua would be complete without the Black Vulture (Coragyps atratus), among the most visible of any bird in the country. Photo Jesse Bickley and Anna James. 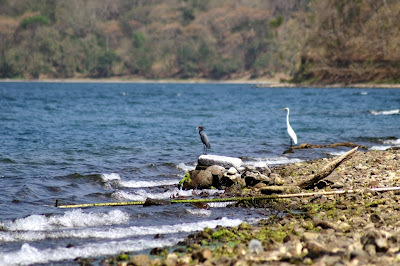 Jesse and Anna also took some great photos of birds associated with Lake Apoyo, too. If you would like to schedule a birdwatching tour with one of our specialized birdwatching guides, please contact us! Lake Apoyo is deep and clear with far less shallow water than a typical lake. Immense, deep areas provide ideal habitat for small, schooling fish in the open waters, and these fish are preyed upon by lots of fish and birds. Most of the shoreline is steeply graded; the water is more than a meter deep just a few steps inward. The shallow areas available for wading birds are somewhat more limited than in Lake Cocibolca, for instance, but several egrets and herons can always be found around the lake, always good for birdwatching. Lake Apoyo as seen from behind Estacion Biologica. Photo Jesse Bickley. The wide expanse of water invites year-round populations of Osprey (Pandion haliaetus), Magnificent Frigatebird (Fregata magnificens), which feed on fish in the open waters. Black Terns (Chlidonias niger) are found year-round, as well, often swimming when not preying on schools of fish. Diving birds such as the Pied-billed Grebe (Podilymbus podiceps), Least Grebe (Tachybaptus dominicus) and Olivaceous Cormorant (Phalacrocorax brasilianus) are found in regions of depths up to about 20 meters. They are usually seen swimming and diving. Great Egret (Erdea alba) flies over Lake Apoyo. Photo Jesse Bickley. Wading birds include Great Blue Heron (Ardea herodias), Great Egret (Ardea alba), Snowy Egret (Egretta thula), Tricolor Heron (Egretta tricolor), Little Blue Heron (Egretta caerulea), and Little Green Heron (Butorides virescens) are found in shallow water along the shoreline. Nocturnal herons are also found, usually seen roosting, in small numbers: Boat-billed Heron (Cochlearis cochlearis), Black-crowned Night-Heron (Nycticorax nycticorax), and Yellow-crowned Night-Heron (Nyctanassa olivacea). Great Egret in flight. Photo Jesse Bickley. Aerial fishing birds also include the Ringed Kingfisher (Megaceryle torquata), which find prey while perched on trees along the shoreline, usually small fishes (Atherinella sardina), then fly out and dive headlong to catch the prey, returning to their perch to consume the fish. Ringed Kingfisher (Megaceryle torquata) in flight over Lake Apoyo. Photo Jesse Bickley. Along the shoreline, during the winter periods, Spotted Sandpiper (Actitis macularia) are common. This species exhibits a characteristic pumping action with the tail while foraging along the shoreline, just out of the water. Other sandpipers and plovers are rare in Lake Apoyo. It is a relatively easy bird for a birdwatcher to follow. Pied-billed Grebe (Podilymbus podiceps) is commonly seen swimming in the clear waters of Lake Apoyo. Photo Jesse Bickley. All you need for birdwatching in Lake Apoyo is good field glasses, an experienced guide, a reference book, and patience. Birds are easily found in several habitats in all seasons. We would be happy to reserve a birdwatching tour for you, just contact us! A Little Blue Heron (Egretta caerulea) accompanies a Great Egret (Ardea alba) in lakeside meditation. Photo Jesse Bickley and Anna James. 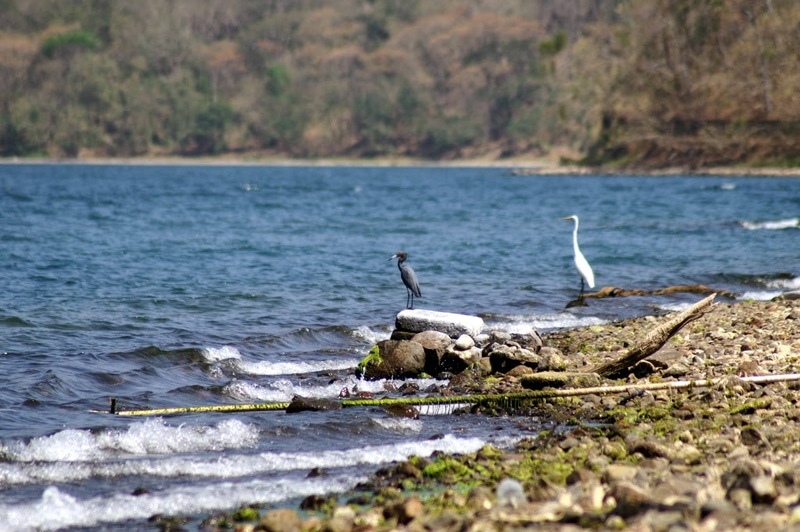 One of the great natural sites of Nicaragua is Lake Cocibolca, also called Lake Nicaragua. Formed a half-million years ago by a depression in the recently-connected Mesoamerican isthmus, this lake is a fundamental component of the economy and culture of the Nicaraguan people. 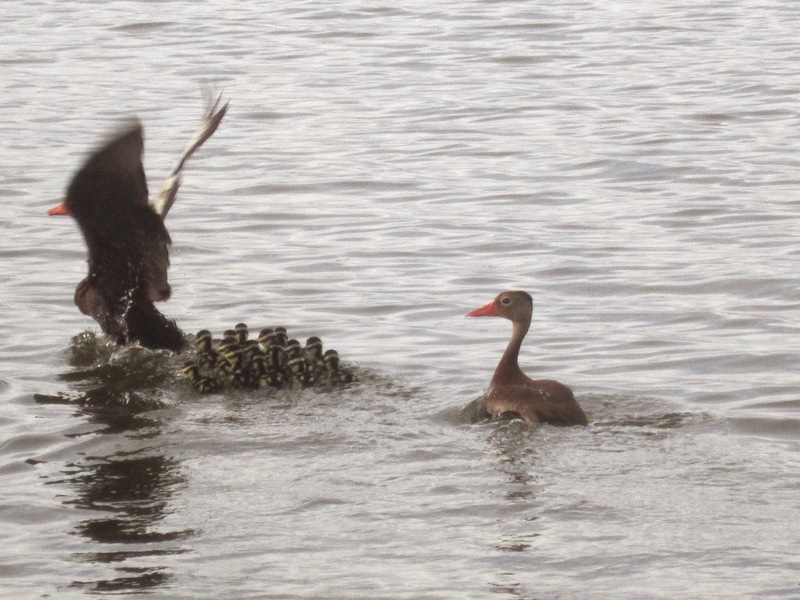 Whistling Tree-Ducks (Dendrocygna autumnalis) take their clutch of hatchlings for a swim in Lake Cocibolca. Cocibolca is among the largest freshwater lakes in the world. There are many important wetlands around the lake and its tributaries. Fish and birds inhabiting Lake Cocibolca and its surrounds are abundant and diverse. The lake was vital to the precolombian people of the zone, with numerous population centers all along its shores. The name Cocibolca comes from the Nahuatl language, but cultural hegemony of the Spanish-speaking settlers led to such severe disregard for the culture and language of the locals that we no longer know what the name means, precisely. One theory is that it means the larger of the twin lakes, the lesser being Xolotlán. Olivaceous cormorants (Phalacrocorax brasilianus) move around throughout Lake Cocibolca and inhabit special places such as Isla Zapote in the Solentinmane Archipielago. Lake Cocibolca is facing huge threats to its health. Nicaragua is notorious for poor management of its aquatic natural resources. Many natural water sources in Nicaragua have already been declared contaminated. Lake Xolotlán, for example, has an extremely high level of contamination from municipal wastewater discharged, untreated, directly into the lake for a century. It also has tons of mercury from a poorly operated chemical facility. Lake Cocibolca is expansive, giving the impression of an ocean from many perspectives. The locals have given it the name, "La Mar Dulce", or the freshwater sea. Several municipal wastewater discharges into Lake Cocibolca are now getting some level of treatment and control. The quantities of contaminants from the general population are dropping, but still at levels that warrant concern. Among the officially listed potential uses of the lake resources is potable water, although no major community gets its water here, yet. Storm clouds accumulate over Lake Cocibolca. More destructive is the vast erosion throughout the watershed of the lake, consisting principally of cattle farms. Soil conservation practices such as ample levels of shade on pasture, gallery forest throughout river edges, and terracing or forest cover on steep slopes, are basically absent in all the farms. Use of pesticides such as ivermectin, for parasite control on cows, and defoliants is universal, and the tools for application are almost always washed directly into the rivers feeding the lake. Almost all pastures are burned at the end of the dry season, promoting a huge pulse of soils and nutrients into the lake at the first rains. Furthermore, agriculture such as rice is grown around the lake, and aerial fumigation dumps thousands of pounds of destructive pesticides each year. An important aspect of Lake Cocibolca is the hundreds of small islands found throughout it. The vastness of the lake means that all these factors have not yet added up to destroy the lake, but like wolves at the door. As in much of the rest of the world, Nicaragua is facing water issues as the most important single conflictive issue of the 21st century. Many practices in the past and present are no longer viable, given ever-greater demands on water and threats that no one ever anticipated. The sense that Lake Nicaragua is pristine and a natural paradise still exists. All visitors to the country should take advantage of opportunities to experience Cocibolca. Its shores, islands, fish and the nature are remarkable. The cities such as Granada, San Jorge, San Carlos and San Miguelito all give great views of the lake, and many islands are worth a visit, from Zapatera to Ometepe and the Solentiname Archipielago.